DemonSouls : In this dynamic fantasy action game, your heroic adventure will see you battle with demons, mastering their demonic powers through their souls! 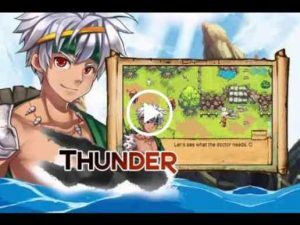 Guide Thunder, who turns from a simple young fisherman to a legendary hero, through this epic journey, as he discovers secrets in this immersing fantasy world, which will help him save the realms of humans and demons! Quests filled with adventure, mysteries and real-time epic battles! Unleash demonic attacks through casting and summoning spells! Level up and customize your character’s attributes! Dialogue choices that will unlock one of the multiple endings! Customize 60 weapons and armor with demonic powers! Over 40 Achievements that earn rewards! Over 50 maps to explore! Intuitive controls for easy to understand game play! As you capture demon souls, your demon field journal will be updated with information about them. Use it to find out the best way to smite your enemies! If your into old school RPG, then you can appreciate this game. Even if your not, this game is still worth your time playing. However, the LV of game difficulty is low and the story is barely above average. The multiple endings gave a pleasant twist to the game, but don’t expect much. Overall it’s a good game. It may not be a chart buster, but it is a good game. The game is fun and it has beautiful color design. I have fun playing it. I don’t like the idea of enslaving demons but I can’t complain much. It is part of the story. I find I come back to this game often and love it, it needs allies to travel with though I feel it’s a bit lonely for the mc.